Reigning from the land of Israel, Queen Makedah is an original artist that sings conscious and uplifting lyrics inspired by The Bible and the Psalms of David, over a unique sound that fuses Soul, R&B vocals and traditional Roots Reggae rhythms. Her musical influences include Luciano, The Legendary Bob Marley & The I-Three's, Steel Pulse, Desiree, The Abyssinians, Bunny Wailer, Sly & Robbie, Ras Michael & The Sons of Negus, The Gladiators, Ziggy Marley, Queen Ifrica, Queen Omega, Aswad, Earth, Wind and Fire. Her musical influences include Luciano, The Legendary Bob Marley & The I-Three's, Steel Pulse, Desiree, The Abyssinians, Bunny Wailer, Sly & Robbie, Ras Michael & The Sons of Negus, The Gladiators, Ziggy Marley, Queen Ifrica, Queen Omega, Aswad, Earth, Wind and Fire. Her vocal influences include Chaka Khan, Billy Holiday, Sade, Lauren Hill, India Arie, Jill Scott, Eryka Badu, Aretha Franklin, Mable Staples and Wanda Hutchinson. Her passion for Roots Reggae music was born as a youth during some of the most controversial events of our time, The Vietnam War, Civil Rights and Black Power Movements of the 70's, via the music of The Legendary Bob Marley and I-Three's, The Wailers, Steel Pulse and Third World to name a few. In the 90's Queen Makedah immigrated to Israel, where her talent as a songwriter began to blossom while collaborating with Brooklyn-born Tuviel ?Chariot' Levi (www.myspace.com/shofarproductions). Tuviel's original tunes, with a style inspired by groups like The Gladiators, The Abyssinians, Steel Pulse & Aswad, brought forth the inspiration for the lyrics behind tunes like ?Healer,? ?Lost Everything? and ?Lift you Up.? Together, they collaborated with Israel's famed reggae group, Roots Africa, before the group broke up in 2001. Queen Makedah and Chariot have been blessed to release two albums and one single on their family label, Oriyah Music. 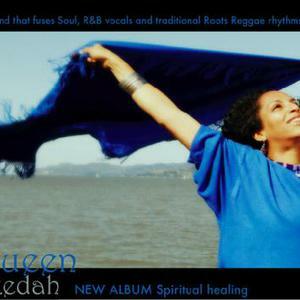 Her freshman album, ?The Awakening,' was co-produced by one of Reggae Music's great legends, Ras Michael of the Sons of Negus (called the 'Nyabingi Specialist' by Bob Marley) and received national and international airplay, excellent reviews and support from reggae music fans and dj's across the globe (see www.queenmakedah.com). Their second album, ?Spiritual Healing' ? their first self-produced album - introduces hot new tracks, like ?Kadosh' (The Holy One of Israel), ?Freedom,' and ?Healer.' The 'Spiritual Healing' album can be purchased now at www.cdbaby.com/cd/makedah2. Queen Makedah performs in Israel and Internationally and has a band in the U.S. and Israel. For bookings, to listen or buy Queen Makedah's music, for concert information, pictures and more visit www.queenmakedah.com or write oriyahmusic@aol.com.